I just don't get it. 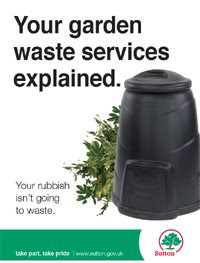 This whole debacle over Sutton Council's recently-introduced £35 per bag per year fee for collecting garden waste. I just don't get it! The reasoning behind Sutton Council's imposition of the fee is simple - to cut down the number of gas-guzzling lorries trundling around the borough picking up garden waste that could quite easily be composted at home (in a compost bin available free of charge from the Council). "What are [old ladies] supposed to do with their garden waste if they can't afford the outrageous £35 per bag per year charge? They can't walk that to the dump" rants one reader on the newspaper's forum. As one who has contendly composted all of my garden waste for the past four years and never once had recourse to the council's garden waste bags, the wrath and rage of local residents is a mystery to me. If you have a garden, you can have a compost bin. If you are fit enough to do cut the grass and rake up leaves then you are fit enough to put them into said compost bin. Granted, I only have a small garden and so generate only a small amount of garden waste. But then if my garden was double the size then I'd have plenty of space for the extra compost bin. Clever, huh? As militant Sutton residents leave their garden waste at the kerbside in 'open defiance' of the new scheme or clog the roads around the local refuse centre, I am left bewildered. If you can't be bothered to compost your own waste and want the luxury of kerbside collections then that's your perogative - but it's only fair that you alone should foot the bill for this service. Meantime, neither myself nor my compost bin can understand what the fuss is all about.